Sony wants to be your first choice for a mobile phone, even if you're not looking to spend big-bucks. Unlike the Z series, the E series phones from Sony are a little bit modest. But don't let that put you off, because like the Motorola Moto G, there's plenty of features in these handsets to make them worth investigating. For one thing Sony is claiming two days battery life from the new E4. That's pretty good, and Sony is one of the few phone companies that manages to deliver on power-related promises. Its Stamina battery tech is pretty nifty and does a good job. Interestingly though, while the E3 enjoyed a 4G option, that's missing from the E4. Other specs are improved over the E3, but only very slightly. The screen resolution has increased from 480x854 up to 540x960, but because the screen has gone from 4.5-inches to 5-inches, that's going to make very little real-world difference to how it looks. At its core there's a very slight processor speed boost, and storage goes from 4GB to 8GB - still not enough, if you ask us. The back-mounted camera is still 5-megapixels too, but the front camera can now record video at 720p and 2-megapixel photos, a huge improvement from the E3. Sony hasn't told us how much it will be yet, but we'd expect it to be as cheap as the proverbial chips if the Japanese firm is expecting to shift many of them. 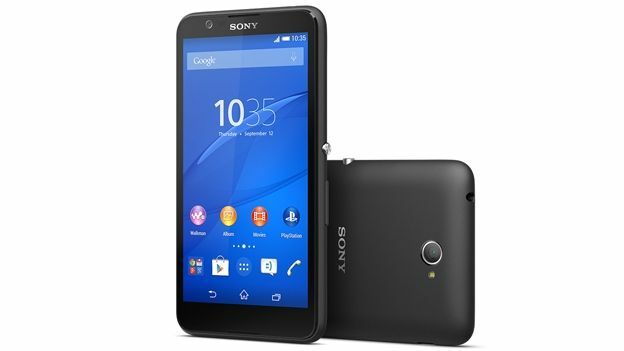 The E3 is about £100, so we'd expect it to be a bit less than that, what with the lack of 4G.